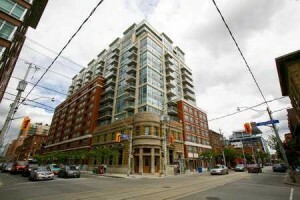 King’s Court In The Popular St. Lawrence Market Area, S/W Corner Suite, Approx 900 Sq Ft, Huge L-Shaped Terrace [Approx. 300 S.F], Spectacular Downtown & Lake Views, Open Concept Kitchen, Unique Walk-Out To Balcony In The Master Bedroom, Walking Distance To Everything, Ttc At Your Door Step. Rooftop Terrace With Bbq Area, Exercise Room, Sauna, Jacuzzi, Party Room, 24 Hr Concierge, Visitor Parking.